2. which way the wind is blowing. 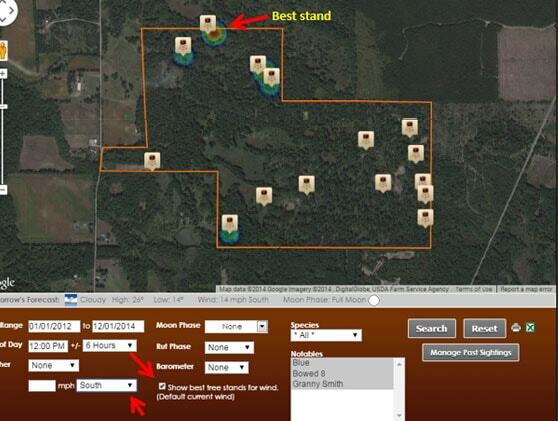 Before each hunt, I use BGL’s search tools to identify the stands that have the most daytime activity for notable animals AND a wind advantage. Figure 2. I selected all photos between 1/1/2012-12/1/2014 from 6AM-6PM (12PM +/- 6 hours) for all of my notable deer (hold down CTRL key and click each notable to make multiple selections). This search shows me where these deer show up during daylight hours. If I wanted to fine-tune the search to just morning or evening, I would select 9AM+/-3hours or 3PM+/-3hours in the “Time of Day” search category. Figure 3. Finally, I click the "Best tree stands for wind" check box and select the forecasted wind direction (which in this case was South). Based on these search criteria, the northernmost stand on the property will give me the best chance of success, so that is where I would hunt.